After Jennifer Grapes retired from the Milwaukee Ballet after dancing professionally for more than a decade, she knew her career in dance wasn’t over. Because for her, ballet isn’t just a career. It’s her lifeblood. She had always loved teaching, but she wanted to teach her way. She had a vision for what classical ballet instruction could look like, and she has brought it to life over the past seven years as founder of the Hinsdale Dance Academy. “Our biggest philosophy is that dance lessons are life lessons,” says Grapes. Many of the students at the academy will not grow up to be professional dancers, but Grapes believes that the skills her students learn will be critical to their future success. “Being responsible, being on time, being able to accept your losses and successes, being happy for others, keeping your commitments—these are all skills that will help them in whatever career they choose,” Grapes adds. Today, Hinsdale Dance Academy is a full-service performing arts academy whose mission is to teach those lessons and bring dance to everyone who wants to learn. Three years ago, the academy moved into a larger space to meet demand of its students. The 14,000-square-foot space has five studios for classes and instruction. All the instructors at Hinsdale Dance Academy are current or former professional dancers, including two male ballet instructors, which is relatively uncommon. Most of the classes for children through adults are classical ballet instruction, but Grapes has added classes in contemporary, lyrical, hip hop, tap, and more to the schedule. Grapes’ first love was ballet, but she also thinks it’s one of the most important genres to study to create a foundation for any other type of dance. Recently, the academy added an adaptive dance program with specialized classes for dancers with Downs syndrome and autism, where the focus is on the power of movement and exploring the joy of movement. It also added a Language Academy, offering classes in Mandarin and Spanish. Finally, Grapes also established a Petite Company, giving younger students the opportunity to be involved in competition and performances. With the studio expansion, additional class offerings, and new programs, Grapes is growing the Hinsdale Dance Academy into a destination that can bring dance to anyone and everyone, children to adults, in a fully inclusive studio with no limitations on who can learn dance. 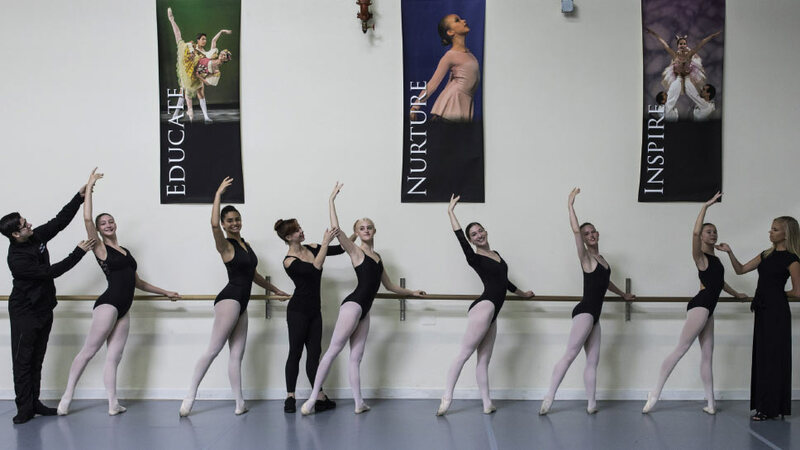 Students as the Hinsdale Dance Academy can eventually be part of the Hinsdale Ballet Theatre pre-professional ballet company (and junior company). This year, the company will put on three performances of the Nutcracker, two of Cinderella, and three summer dance concerts. Plus, select dancers will take part in the Youth America Grand Prix, the world’s largest international student dance competition and scholarship program. Earlier this year, the academy won the prestigious Outstanding School Award by the Youth America Grand Prix. The high caliber of instructional talent Grapes brings to the academy is part of the reason for that. Guest instructors from companies such as Alvin Ailey, American Ballet Theatre, Boston Ballet, Joffrey Ballet, Kirov Academy, Milwaukee Ballet, New York City Ballet, and more from around the world have taught at the academy. “Ballet—it’s a part of my soul,” Grape says. “Growing up, I had air, food, water, and ballet. It was a piece of me,” she adds, and you can tell how much time, talent, and energy she has put into growing the Hinsdale Dance Academy into what it is today—which is one of the best instructional studios in the area. Hinsdale Dance Academy is located at 645 Blackhawk Drive in Westmont, 630-484-3241, hinsdaledanceacademy.com.